We've grown to love Batman: The Brave and the Bold, but its replacement as Cartoon Network's regular Batman show will definitely have a hard time growing on us. 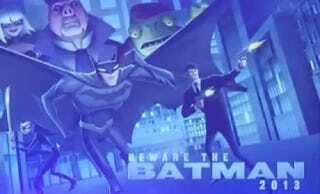 Beware the Batman, coming in 2013, features weirdly angular computer-animated artwork, plus a gun-toting Alfred. And instead of Robin, Batman's sidekick will be Katana, the female ninja from the Outsiders. Also, instead of the Joker, the show plans to use less well-known villains like Professor Pyg and the Circus of the Strange. The good news is, it's executive produced by Batman Beyond's Glen Murakami. The other good news is, Cartoon Network's new "DC Nation" bloc also will include some stuff we're pretty sure we'll love, according to a presentation in Cannes, France by Warner Bros. Animation's Sam Register.